I'm just gonna put this out there - I love monograms. Okay there I said it. I'm a monogram-aholic. I would monogram my forehead if I could...okay, not really. Anyway, I had this old frame that the glass had broke and I didn't really care for the silver. Originally I used it to make a DIY jewelry organizer for daughter, but she never used it and I thought I could put it to better use....and so I upcycled it, again! 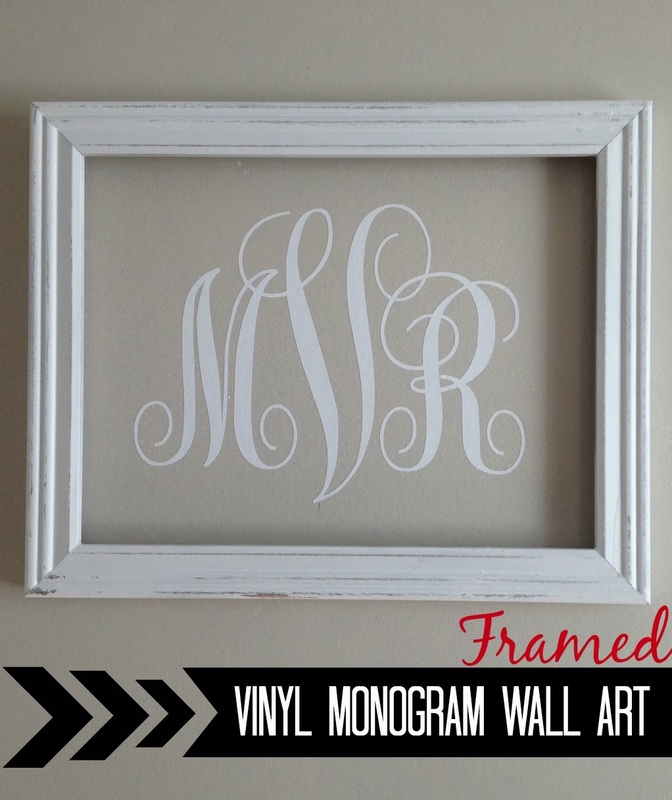 If you have an old frame and you want to get this look check out how I accomplished it here before you move on to cutting your monogram. Alright, let's start cutting! 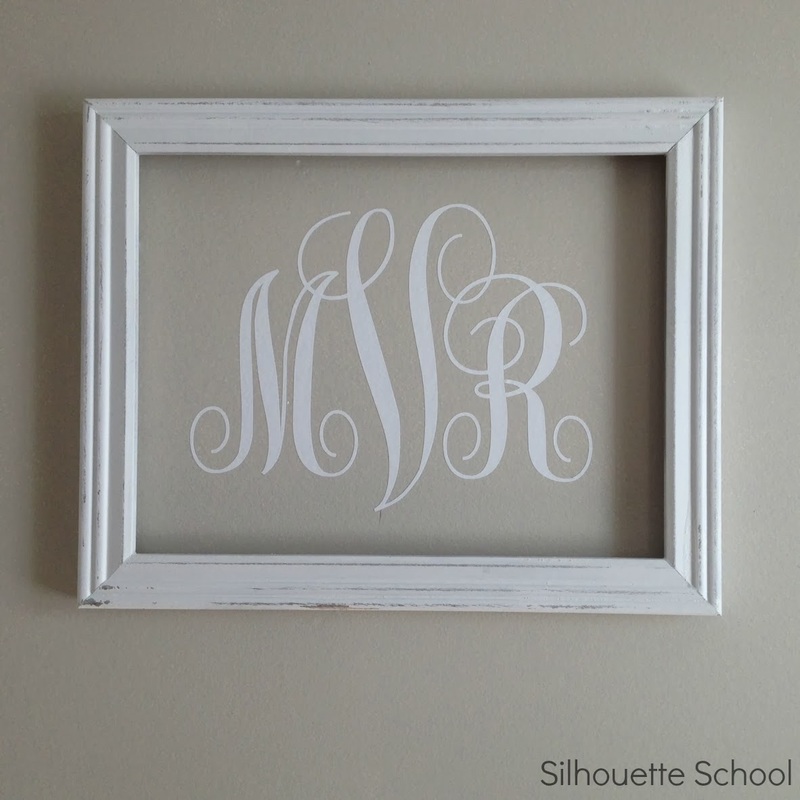 This is a really simple Silhouette project that has a huge impact. First, you want to make sure you have the font Monogram KK downloaded and installed on your computer. If you don't, you can get it for free at Dafont.com. Now open up Silhouette Studio (you must do this after the font installs on your computer or it won't show up in SS's font list). For a married monogram the wife's first initial is on the left, the last name is in the middle and the husband's first initial is on the right. So go ahead and pick the font tool and Monogram KK font and type the three letters with the first and third letter being lower case and the middle (last name) initial upper case. Monogram KK automatically sizes them for you! So cool. Now you're going to enlarge the entire design. I wanted my monogram a little closer together so I ungrouped and moved the letters around slightly. It's very helpful to reveal your cutting mat grid at this point so you can make sure the letters are lined up. Once I had the monogram how I wanted it, I re-grouped the letters and welded them together. Here's my lesson on welding if you need to brush up. Then I enlarged the entire design one last time so it filled my cutting area. Now it's time to load the vinyl - no mat necessary which makes cutting vinyl super easy. Send the design to the Silhouette and wait for the magic. Full lesson on getting started with Silhouette vinyl here. Once the monogram is cut you can remove the excess vinyl and leave only the monogram design on the backing. Then use a piece of transfer paper (did you know you can reuse it?) 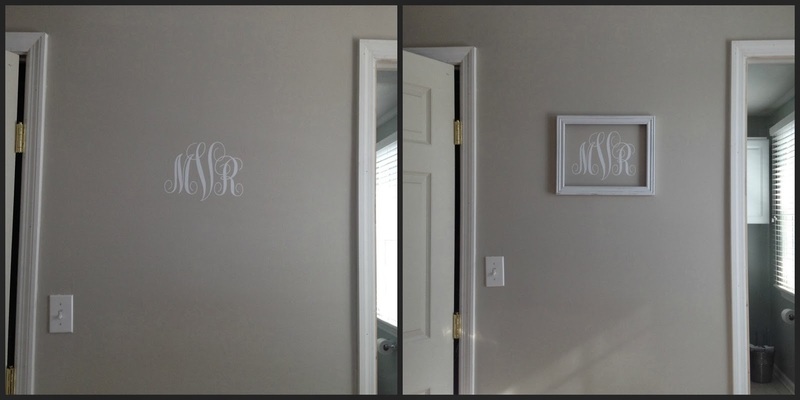 to move the monogram from the backing to the wall. Press it hard onto the wall and then starting from the corner - and using a popsicle stick or credit card as you go - smooth the vinyl down to make sure it sticks to the wall and not the transfer paper. Looks good, right? But it looks even better when you frame it, don't you think?! I am so happy I found your blog. You can't imagine how much you have taught me how to use my Portrait. Now I wish I would have purchased the Cameo. Thank you so much. I'm glad you found Sil School too Bonnie!